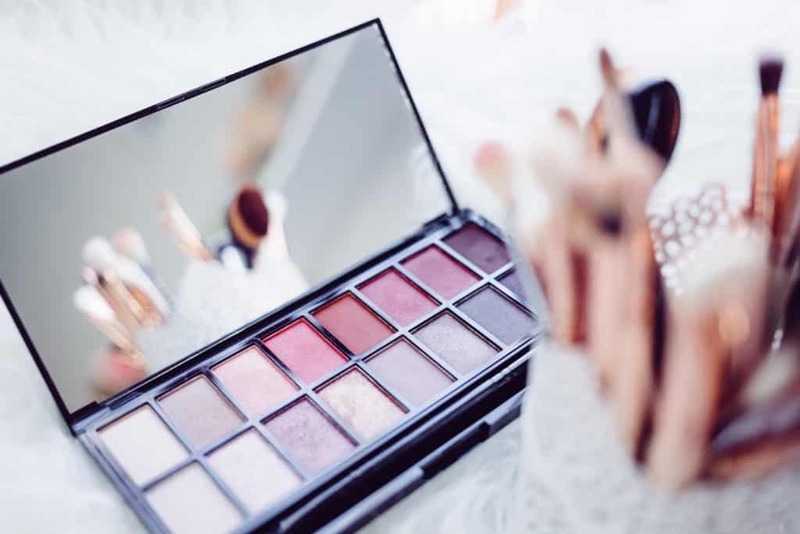 Whether you’re a makeup novice or have been experimenting with cosmetics for years, it’s crucial to have a collection with makeup essentials that will allow you to create a go-to everyday look. 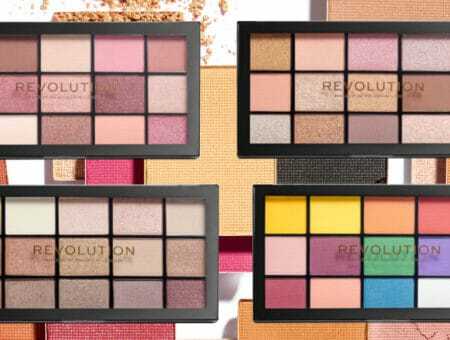 After acquiring the makeup basics, it is that much easier to add playful or trendy makeup products to your collection and incorporate them into your beauty looks. In this article, I’m going to take you through the most important makeup products for young women, whether you’re a makeup novice who is leaving for freshman year and isn’t sure what to bring, or you already have some experience under your belt and are looking to fill some gaps in your collection. So, keep scrolling to see my list of makeup essentials for your face, eyes, and lips, as well as essential tools for applying and storing your makeup. While some people don’t think that face primer is necessary, I personally view it as a vital step in my makeup routine. Face primers’ exact effects on your skin and makeup can vary, but overall, their main purpose is to keep your skin looking smooth and your makeup looking fresh all day long. Regardless of your skin type, there is a primer for you, whether you’re looking for a formula to control oil and/or acne, moisturize, smooth out uneven texture, color correct, etc. Foundation is probably the hardest part of your makeup routine to get right, as you not only have to consider the type of coverage you want (i.e. sheer/natural, medium, or full), but also your skin type and undertones. If you are new to wearing foundation or aren’t sure what type/shade is right for you, I’d highly recommend going to your nearest Sephora, MAC, or department store and have a makeup artist help you pick out one that matches your complexion and fits your coverage needs. It’s also a good idea to request a sample if you want to see how a formula feels on your skin before buying. Even if you would prefer to buy foundation at the drugstore, I still recommend getting matched at a higher-end store first. This will give you a better idea of which shades to look for. Also, there are lots of online foundation-finding tools you can use, such as Temptalia’s Foundation Matrix, Sephora’s Color IQ tool, and Findation. Personally, I prefer BB cream to regular foundation, as I find it to be much more natural-looking. It is a great option if you’re looking for something that has skincare benefits such as moisturizing or priming (some BB creams have primer built in). In addition, if you are new to the makeup world, a good BB cream is an even better place to start than foundation, as it feels lighter on the skin, is hard to overdo, and can be applied with your fingers. If you have acne, dark circles, or any kind of discoloration, concealer is a must-have. Concealers come in full-coverage and sheerer-coverage formulations, and which one you should choose depends on how much you’re trying to cover up. When choosing a concealer for acne and/or discoloration, find a shade that is as close as possible to your foundation/BB cream shade for the most natural look. Dark circles are a bit more complicated, since there is so much variation in their shades and how they look on different skin tones, but in general, it’s a good idea to use a peach or pink-toned concealer to cover them up. Want help buying a concealer? See our list of the best concealers for every budget, where we list all of our all-time fave concealers. Putting on blush can have a huge effect on your overall look, and I personally never leave it out of my makeup routine. Blush is especially necessary if you’re wearing a foundation with more opaque coverage, which can sometimes leave your complexion looking a little bit flat. Blush comes in powder, gel, and cream formulations, with powder being the most popular. Recently, though, cream and gel blush have become very popular as well. When choosing a blush color, pick something that’ll give you a natural flush. Regardless of your skintone, be careful not to go too bright or to use too heavy a hand when applying, as these things can make you look clownish. In general, pink and peach tones work best on fair-to-medium skin, while mauve, purple, and maroon shades work best on darker skin tones. Something that I recommend trying, no matter your face shape, is applying blush both on the apples of your cheeks and diagonally up towards your hairline. This will not only give your face a healthy wash of color, but will also serve to emphasize your cheekbones and highlight the natural contours of your face. It also looks more natural than simply applying blush to the apples of your cheeks, as long as you blend well. Get a rosy glow with our roundup of the best blushes ever. Speaking of highlight, I couldn’t leave highlighter off of this list! Like many other beauty products, highlighter comes in various different forms: powder, cream, liquid, stick, and powder/cream hybrid. Each of these forms has its own unique benefits, but for beginners I recommend either powder or stick, as they are the easiest to work with. My fool-proof method for applying highlighter is to lightly apply it along the bridge of your nose, the tops of your cheekbones, your cupid’s bow, and just below your eyebrows. You can even multi-task and use your highlighter as eyeshadow! Lastly, much like finding the perfect shade of foundation, finding the right shade of highlighter depends on your specific skin tone and undertones, so it’s a good idea to test out different colors in person if possible. Our guide to the best highlighters has even more choices for every budget. 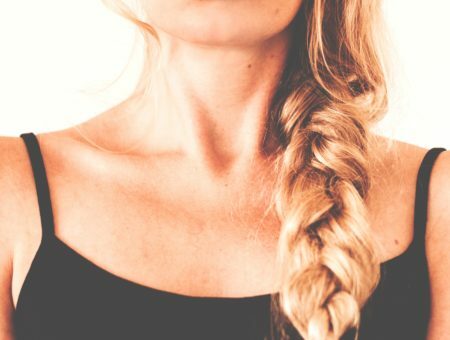 As someone who loves being pale, I don’t really use bronzer; however, if you are trying to get a sun-kissed look, using the right shade of bronzer is essential. I recommend going no darker than one or two shades deeper than your natural skin tone, and either lightly dusting it all over the high points of your face for a healthy glow, or simply in the hollows of your cheeks (below where you’d put your blush) for a more chiseled look. Either way, be sure to use a light hand and to blend well! As for matte vs. shimmery, that depends on the rest of your look: If all the other products you’re using on your face are matte and you want to add some radiance, go for something with a bit of sparkle. But, if you’re already using other shimmery products, stick with a matte formula to avoid shine overload. Love the bronzed look? See our list of the best bronzers for a sun-kissed glow. Much like face primer, setting spray/powder works to keep your makeup in place all day. There are different formulations depending on what type of finish you’re after (e.g. matte, radiant, etc.) and what skin care benefits, if any, you would like your setting spray/powder to have (e.g. moisturizing, oil-absorbing, etc.). If you want your makeup to last, though, don’t skip this step! See our posts on the best setting powders and the best setting sprays for our favorite beauty buys! Eye primer has been a lifesaver for me, as before I started using it, my eye makeup would literally be nearly gone within two or three hours. A good eye primer should not only prevent your eye makeup from sliding off, fading, and creasing, but should also be in a formulation that keeps colors looking true to how they’re supposed to all day long. Keep in mind that eye primers aren’t just for those with oily skin–there are many formulations on the market with moisturizing, color-correcting, and anti-aging benefits. Along with highlighter, eyeshadow is my favorite makeup product, simply because it comes in so many different colors and finishes, and can be used in so many different ways! Personally, I prefer to buy single eyeshadows rather than palettes, since I don’t have to worry about wasting money on shades that I won’t use. (See our guide to the best eyeshadows for specific product recs.) However, if I didn’t already own similar single shades, I’d definitely look into buying an Urban Decay Naked Palette, all of which are great for beginners. Mascara has a magical way of pulling your eye look together, and comes in countless different formulas that lengthen, thicken, and curl your eyelashes. Black is fine for most people, but if you have very light-colored lashes, you may want to look into getting a brown mascara instead for a more natural look. Love mascara? Check out our guide to the best mascaras for perfect lashes. Love falsies? We have a guide to the best false eyelashes too! Eyeliner, like mascara, can also add the little extra something needed to really make your eye look pack a punch. While black eyeliner is often considered a staple, consider giving brown or dark gray a try if you have lighter skin. There are countless ways to apply eyeliner, but my favorite way is to simply draw a thin line at the lashline and wing it out just a touch beyond my eye. You can also use eyeliner to line the waterline if you want to make your eyelashes look thicker. In fact, there are eye pencils and kohl products that are made specifically for this sensitive area. Finally, if you want to try liquid eyeliner but are afraid of messing up, I would recommend first lining your eyes using a similarly-colored eyeshadow or pencil liner, and then going over this line with the liquid liner. I’ll admit, I don’t do my eyebrows, as I like how they look naturally. But, if you are looking to up your brow game, there are lots of different eyebrow products out there to really make them stand out. Eyebrow products come in various formulations, including pencil, powder, mascara, pomade, wax, and gel, and which one you choose will depend on your needs. Whether you’re going for a natural look or are going for something a little more dramatic, be sure to use a light hand and slowly build up intensity to avoid the artificial, drawn-on look. Also, dramatic fades and sharp edges can often be too much for real life, so, when in doubt, simply follow the shape of your own natural brows. Lip gloss was popular in the early-mid 2000s, but recently has been regaining traction, with trendy brands like Anastasia Beverly Hills, Glossier, and Fenty Beauty all serving up their own versions. Use lip gloss when you’re in a rush, don’t have access to a mirror (it’s hard to mess up), or when the rest of your look is more dramatic and calls for a subtler lip. 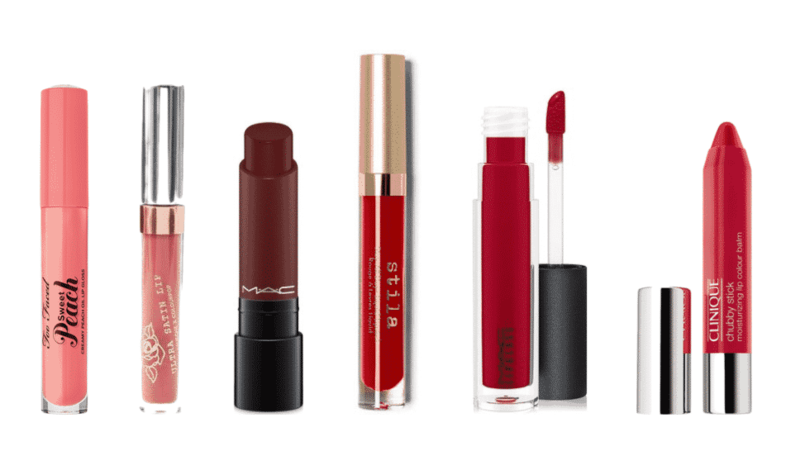 Psst – check out our roundup of the best lip balms, tints, and glosses you can buy. You can’t deny that lipstick is having a major moment right now: Whether you go for a liquid or bullet formula; a glossy, satin, or matte finish, there is definitely a lipstick out there that’ll meet your needs! For beginners, I’d recommend starting off with a color that is close to your natural lip shade, as this is the easiest to just put on and go. Once you’ve gotten the hang of that, it’s a good idea to find a classic, goes-with-everything red that you can wear to class or for special occasions. Experiment with a glossy formula or a lip balm for a softer look, or a matte formula for a more glamorous look. Furthermore, I suggest pairing a red lip with very natural makeup, or none at all. See our list of the best lipsticks ever for even more product recs! Be sure to look for high-quality brushes from brands such as MAC and Sephora Collection, as they should last you years with regular cleaning and proper storage. 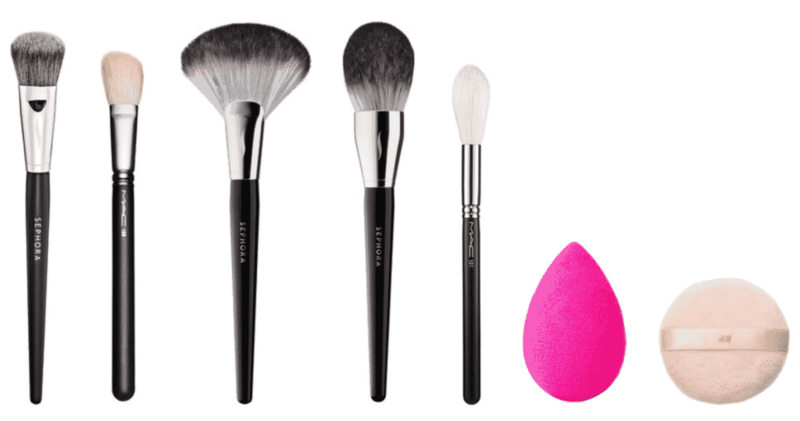 Brushes to look for include a face brush (for applying foundation), a smaller, fluffy angled brush (for applying blush and/or bronzer on the cheeks), a fan brush (for applying highlighter), a fluffy powder brush (for applying finishing powder or bronzer all over your face), and a basic eyeshadow blender brush. For more details, see our list of essential makeup brushes. PS – Our guide to cheap makeup brushes gives you all the details on the best affordable beauty tools. Furthermore, if you choose to apply your powder using a powder puff, then you don’t necessarily need the powder brush (unless you want to use the powder brush for bronzer). Now that you’ve got all of the essentials, you need somewhere to store them! For all brushes and makeup products, simple makeup bags/pouches work well, while brush rolls are great for storing–you guessed it–brushes, and are also great for traveling. Pencil cups and even empty mason jars are also great options for storing makeup brushes. If you have a larger collection of makeup, consider investing in a plastic storage drawer. When in doubt, just do what I do and sort everything into plastic bags based on category (e.g. face, eyes, and lips). It’s not the most glamorous option, but hey, it works! I hope this article has been helpful to you, whether you’re a makeup novice or a fully-fledged expert! Also, if you have any questions about anything in this article, feel free to leave them in the comments, and I’ll do my best to answer them! 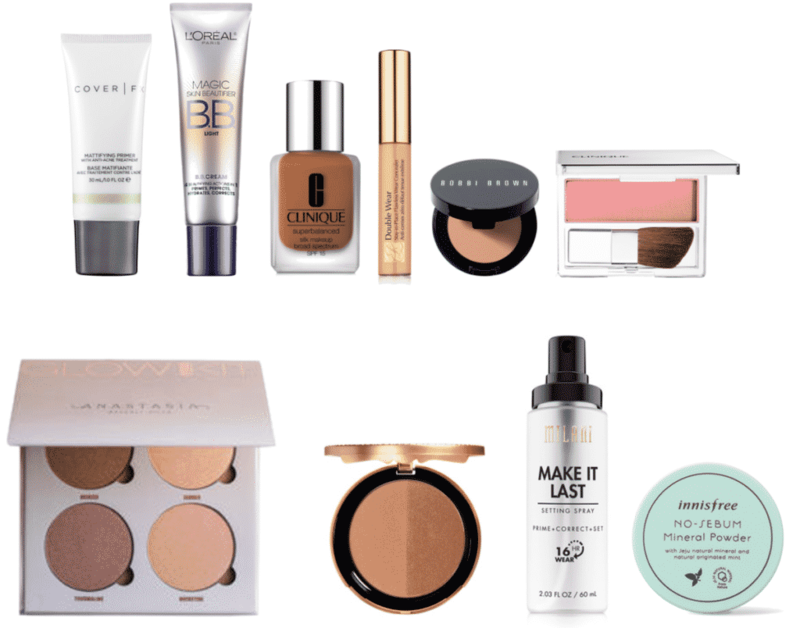 Do you own all of the makeup essentials listed here? What are some of your favorite makeup products? Are there any essentials that I didn’t include in this list? Editor’s note: This post was originally published in 2011; it was completely revamped in 2017 with updated items and tips.